And an entitled three year old who thought SHE should have everything, too. Everything from the Target toy aisle, anyways. No matter how I tried, I could NOT convince her to pare down her list. Every catalog that came in the mail, every trip to Target for diapers, even phone calls to the grandparents seemed to unleash her inner Gimme Monster. On one particularly bad, trying-to-make-a-list-for Santa Claus day, this Mama had had enough. I sat Lila down and we had a long talk about what Christmas was about, and how we celebrate our love for each other with our family and friends by giving one another gifts. I honestly thought I was doling out a punishment. I explained to her that she was going to be using her own money to buy gifts for others. I was thinking “That’ll teach her a lesson!”, but you guys. Her eyes lit up with JOY. I have never seen the spirit of giving so alive and well as in my little three year old who was able to use her own savings to thoughtfully bring joy to others. We made a list of family members that we wanted to shop for. I also reminded her that there are little boys and girls in the world that don’t have many toys of their own, and suggested she add them to the list as well, which she happily agreed to. Then we took her hard earned money and counted out one dollar for each person on the list, placed it in a fancy purse, and I took that little lady out on a shopping date to the Dollar Tree. Lila had so much pride as she walked through the aisles and shopped so thoughtfully for each member of her family. The beauty of the Dollar Tree is that she could pick anything for anyone without going over budget, so she really felt in control of the experience. The one dollar/one gift ratio really helped her to understand what she was doing. Some of the presents were a little out there, because DOLLAR TREE- a light up rainbow candle for her aunt, a hairbrush for the dog- but I think that made them even more precious to the recipients. Before we left the store, I let her pick out wrapping paper and bows to use. As we strolled the aisles, she happily told each person she saw that she was buying Christmas gifts for her family (with her OWN money). When we got home, we spent a full hour wrapping and making gift labels and placing presents carefully under the tree. Did it Stop Her Entitled Attitude? Did she stop asking for things? No, she didn’t. But every time she started to go down the Gimme Hole, I was able to redirect her by reminding her how excited she would be to give her gifts as well, and ask if she remembered what she had chosen for Daddy, or something along those lines to guide her back on track. This year, she’s asked me when she’s going to go shopping for her family again, and I truly cant wait to take my little lady on our little date, and watch her eyes light up again as she experiences the holidays as a giver and not just a receiver. That’s such a sweet lesson and so important for kids to learn! 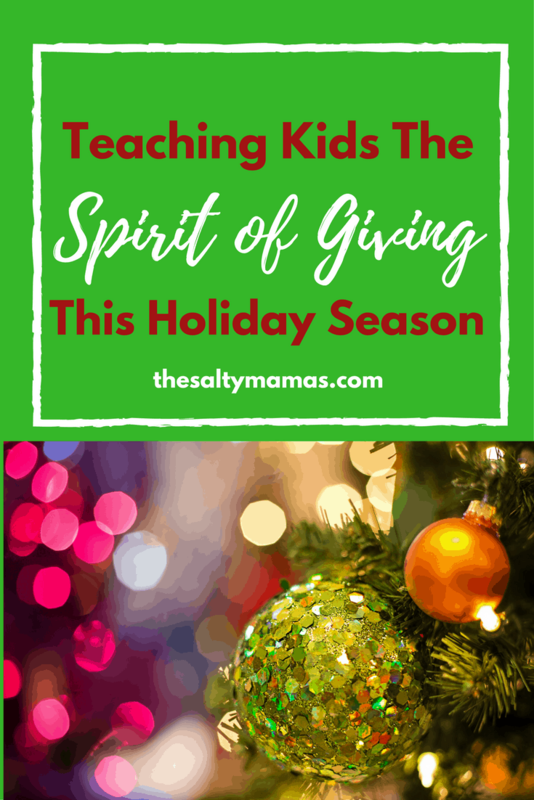 We don’t celebrate Christmas with presents, partly because of the Gimme Monster, but I love the idea of kids using their own money to buy loved one’s gifts! I love this! Great job teaching your children an important life lesson. It’s definitely important to teach your children the value of giving. My son is so obsessed with getting Ive definitely failed in that aspect. Great advice! Great lesson to teach children. It’s more to Christmas than receiving. Definitely will be teaching this to my son when he gets a little older. This is something that a lot of people seem to overlook when raising littles. Teaching our kids how to care for others is the foundation of becoming a good person! Love this!! Really smart idea. You Salty Mamas… funny and smart. It’s like not fair. This is such a great post! I try to teach this to my class of preschoolers as well. It is so important to remember that it’s about giving more than receiving! There really is so much joy in giving, it’s great to let your kids experience that side of Christmas too!